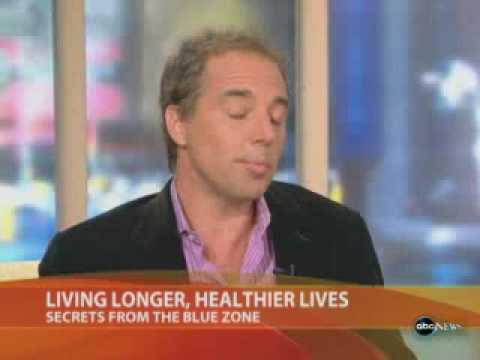 After extensive research on the island, acclaimed New York Times Best Seller author of "Blue Zones", Dan Buettner and his team, discovered the secrets of longevity on Ikaria and declared it as one of only 5 other Blue Zones worldwide. 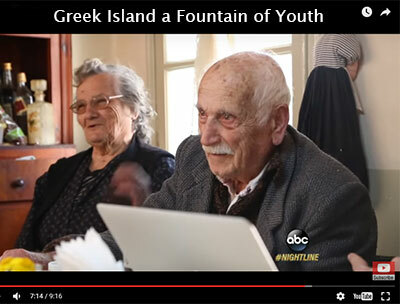 A Blue Zone is defined as a place where the environment is conducive to old age and in Ikaria it was found that residents are several times more likely to reach the age of 90+ compared to normal. Its also notable that on Ikaria instances of cancer, cardiovascular disease, and diabetes are significantly lower, and dementia is rare. Besides the Greek island of Ikaria the other Blue Zones of the world are: Nicoya in Costa Rica, Okinawa in Japan, Loma Linda in California, and Sardinia, Italy. What is the secret of Ikaria which gives Ikarians a better chance of a long and healthy life compared to the rest of the world? Its a combination of factors including diet, social life and exercise. Little or no stress, maintaining a home vegetable garden, looking out over the bright blue Aegean Sea, walking in nature, picking and eating fresh fruits, vegetables and nuts, drinking wine with your friends and family, sleeping well and taking a siesta (short afternoon nap) and eating according to the Ikarian Diet. The Ikarian Diet is based on lots of homegrown vegetables including wild vegetables and beans, limited amounts of sugar and meat, more grains and fish, goat milk, honey, herb tea, Ikarian red wine and, of course, olive oil. 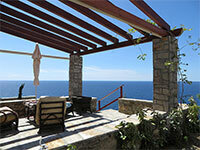 For Ikarians, keeping a garden is also a very healthy way of life. Not only for the homegrown vegetables, but because it means plenty of exercise: digging, sowing, weeding and harvesting. 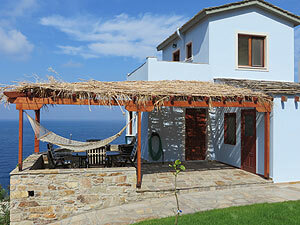 In general, the topography of Ikaria makes physical activity a necessary part of the Ikarian lifestyle. 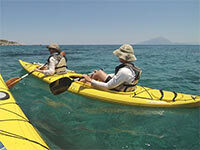 Ikarians burn calories just by walking around their homes and villages, in addition to working outdoors. The surprising factor of Ikarian longevity is the social side of it. Family ties here are very important and houses often contain multiple generations. Grandparents in Ikaria play an important role in the upbringing of their grand children and the household. This means that older Ikarians have an active social role. From the Ikarian perspective, living alone is unhealthy.